Wow! 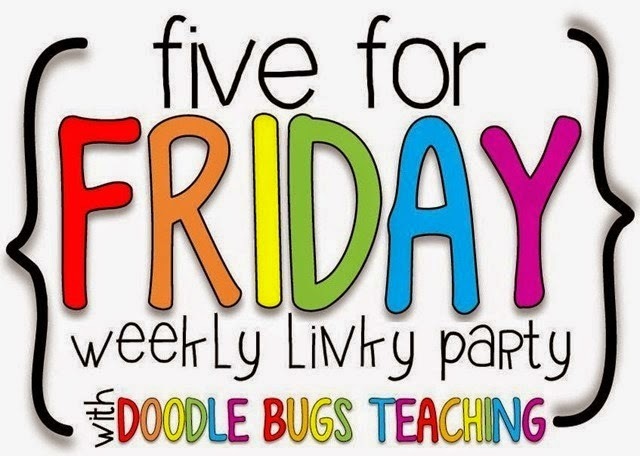 It is Friday and I am actually able to post a 5 for Friday! Is it a miracle? Nah, just my little Kindergartener is home sick, so I am taking care of her. Unfortunately, I think I am next. It's that time of year and I have a monsterous migraine. Anyways, here are FIVE things we did this week that were note worthy! 1. 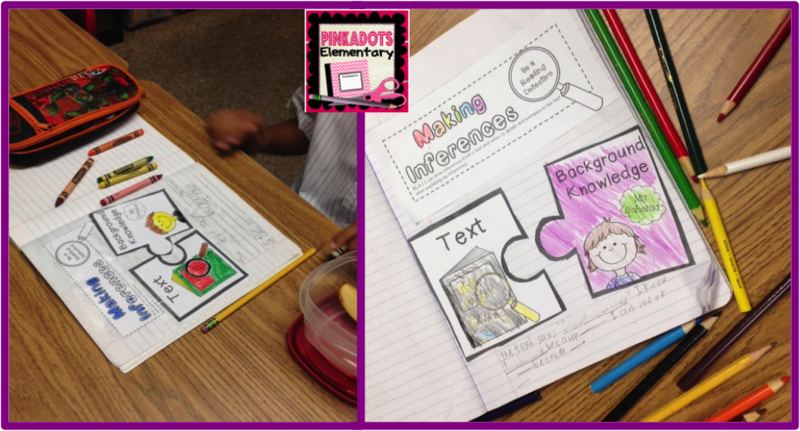 We worked on our first interactive piece for our Interactive Reading Notebook (from Nicole Shelby's IRNB on TPT). The kids loved, cutting, gluing, coloring, and seeing the end result. Inferencing is something we are working on for the next few weeks. 2. 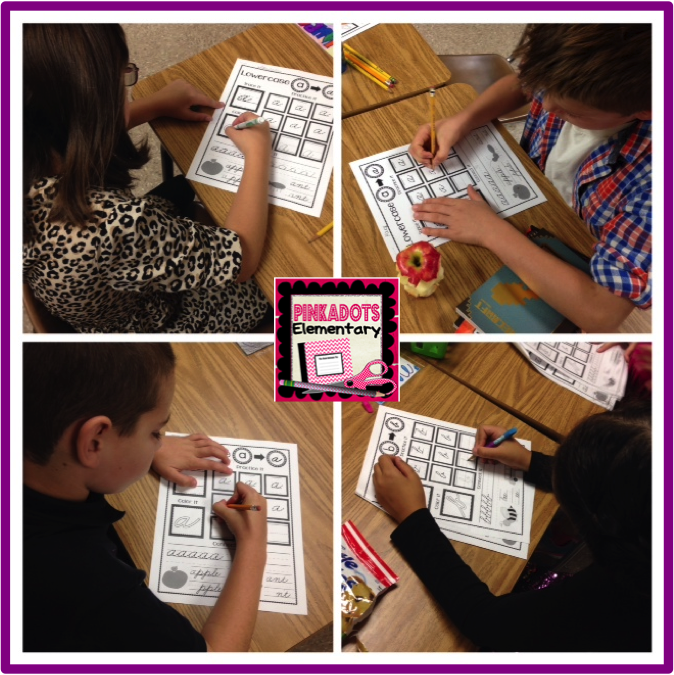 While continuing with inferencing, we read Mercedes and the Chocolate Pilot. One of my personal favorite stories. 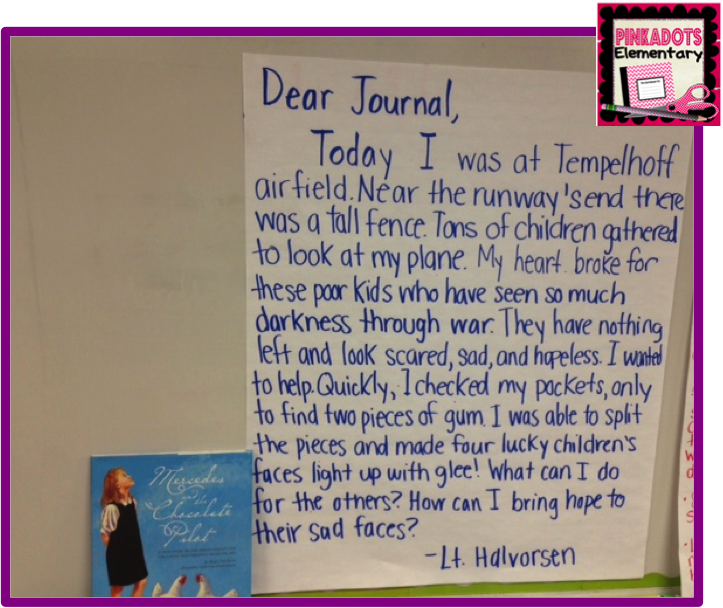 After reading the story, we read a few pieces of nonfiction about WWII, the Berlin Blockade, and the Berlin Airlift. The students absolutely LOVED this and were so emotional over the issue when they realized the book was based off of a REAL EVENT. The students wrote down quotes on post its while listening to the read aloud. 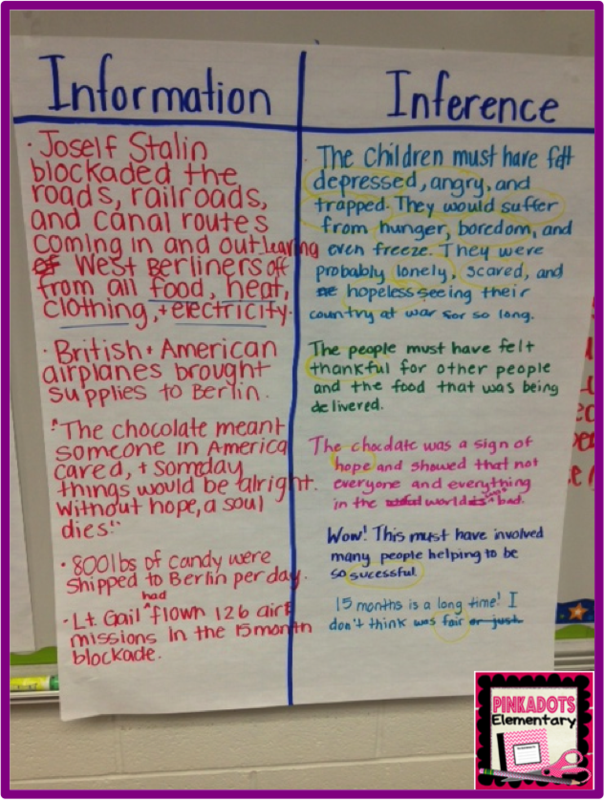 The quotes were examples that led the students to infer how the people of Berlin must have felt during the Blockade. I charted on a T-Chart while the students copied it into their notebooks. 3. The next day, the students were supposed to refer back to their notes and write a narrative journal entry from the perspective of Mercedes. As a example of the (I do, we do, you do) gradual release model, I modeled with the perspective of Lt. Halverson. When I started writing the entry, the students became really involved. After turning and talking with partners, they helped me add on to the journal entry and we were really pleased with the results. When I gave the students their assignment (To write a journal entry pretending they were Mercedes, the night she received a package from the Chocolate Pilot) they were more than ready to begin. I will post some of their responses next week, after I get to grade them. 5. Time for the special freebie! I made this sheet for my principal who passed it around at the staff meeting this week. 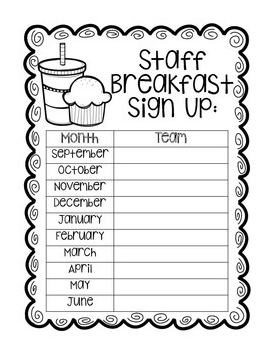 Do you do staff breakfasts? Do teachers donate to them? What does your staff do to boost moral in the school? I'd LOVE to know and hear any suggestions! Thanks for reading! Have a wonderful Friday and weekend! We have to teach cursive writing here and there has been a lot of debate over a new handwriting policy and lead ins and lead outs this week! Staff breakfasts sound like a good way to raise moral. We might need to do some of those!